The XTENDEX?DVI-D Dual Link Extender via Fiber Optic Cable extends a digital flat panel display up to 330 feet away from a DVI-D dual link video source using fiber optic cable. 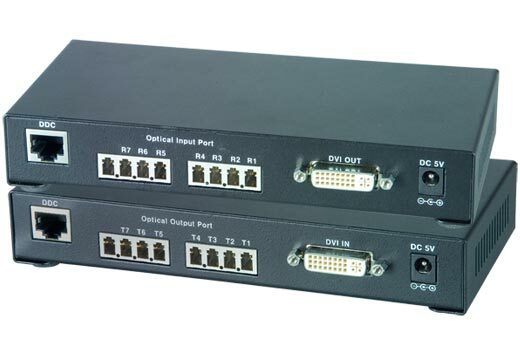 Each DVI optical extender consists of a transmitter that connects to a computer and a receiver that connects to a monitor. Supports single link and dual link by selectable function switcher. Supports 2560x1600 QXGA resolution for dual link devices. Supports 1920x1200 WUXGA resolution for single link devices. Transmits DVI-D signal over 7-strand multimode LC fiber optic cable. Real mode: Uses one CAT5 cable for DDC. Emulation: pseudo-DDC detection function for EDID (extended display identification data) information. 110 to 220 VAC at 50 or 60 Hz via AC adapter. Operating Temperature: -32°F to 122°F (0°C to 50°C). Storage Temperature: -4°F to 158°F (-20°C to 70°C). Use two FIBER-2D-LCLC-50-xxM (2 duplex LC 50-micron) multimode fiber optic cables to extend the receiver from the transmitter up to 330 feet (not included). Use one CAT5 cable connected between the transmitter and receiver for DDC (not included).